STANDING outside her home in central Rwanda, 19-year-old Ernestine Ituze describes falling ill last year. She was coughing violently and had lost her appetite. A community health worker diagnosed tuberculosis and Ituze was treated at the nearby government hospital, a few kilometres down a red dirt road lined with banana and mango trees. A few months later, she is healthy and continuing her studies to be an accountant. Ituze’s treatment cost her almost nothing under Rwanda’s national health insurance programme, Mutuelles de Santé, which covers 81% of the population of 11m. Another 10% are covered by government insurance for soldiers and civil servants. At 91%, the proportion of Rwandans who have health insurance is by far the highest in Africa. Those lacking it are mostly hard-to-reach rural poor. 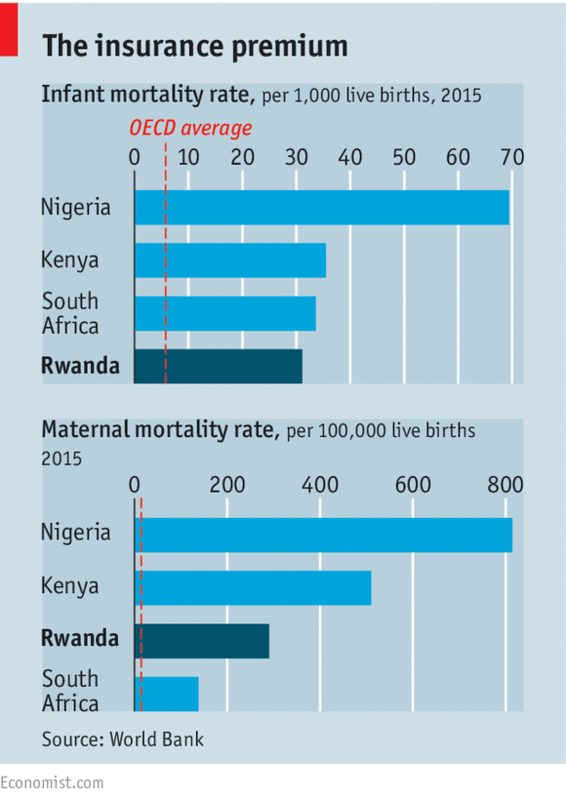 From the ashes of the 1994 genocide Rwanda has emerged as an unlikely public-health exemplar (see chart). In 1990 some 1,400 women died for every 100,000 live births. By 2015 that figure had dropped to 290, making the country one of just a few in Africa to meet the Millennium Development Goal of cutting it by three-quarters. Rwanda has made similar strides in curbing infectious diseases and infant mortality. Between 2000 and 2011, the mortality rate for tuberculosis fell from 48 per 100,000 cases to 12. The health-insurance programme was a big part of the reason for all these successes. How did a poor, rural country (income per head is $690 a year) manage to create a reasonably effective national health system? Aid helped: half of Rwanda’s health budget still comes from foreign donors. But similar volumes of aid have yielded scant results in other countries, so that cannot be the whole story. Well-trained gatekeepers have made a big difference in Rwanda. Health workers from villages were trained to give primary care and refer people like Ituze to clinics for serious illness. Today there are 45,000 of these community health workers. They also encouraged people to join Mutuelles de Santé after a pilot plan was launched in 1999. Jean-Olivier Schmidt of GiZ, the German government aid agency, helped advise Rwanda on setting up Mutuelles de Santé. At first, people asked if they would get their money back if they didn’t get sick, he recalls. The programme eventually gained momentum; but then membership plateaued. To expand it further, Mutuelles de Santé started giving discounts to the poor. The most hard-up pay nothing for membership of the programme; wealthier folk pay about $8 a year. Visits to doctors then cost just 30 cents or so. Foreign aid still covers 30-40% of Rwanda’s overall budget. If donors were to become disillusioned with the country, its health services would struggle. But despite the government’s autocratic record, there is not much sign of that; it’s tough attitude towards corruption is one reason why the scheme is managed so well. Rwanda shows how quickly a nation can improve its health by tackling the diseases of poverty, such as diarrhoea and pneumonia, that are widespread and deadly but cheap to treat. (A dose of oral rehydration salts for diarrhoea, for example, costs only a few cents.) The next challenge will be to treat chronic diseases such as cancer and heart disease, which grow more common as more people survive to old age. These will be much harder and costlier to deal with. However, their prevalence will be a sign that Rwanda has got the basics right. Other African countries should take note, though few have. About one-third of Ghanaians are covered by a National Health Insurance Agency and community funds. Tanzania is trying to boost enrolment in its community health programme, with help from GiZ and the American and Swedish aid agencies. Coverage in rural areas is only about 20% of the population. Other countries including Mali and Senegal have introduced small health insurance programmes in the past 20 years. But they have failed to take off—probably because of a lack of government engagement, says Mr Schmidt.